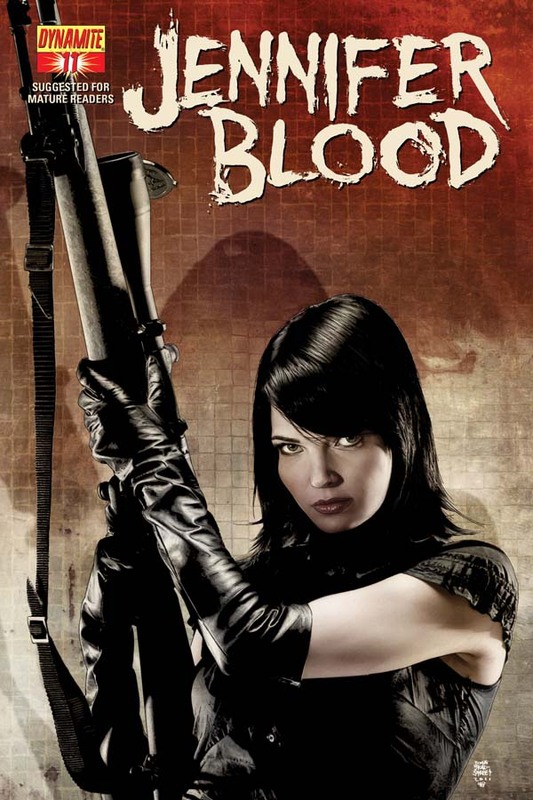 The Fellowship was fortunate enough to obtain a copy of JENNIFER BLOOD #11 from Dynamite Entertainment. Al Ewing writes, Kewber Ball draws, Inlight Studios colors, and Rob Steen letters. 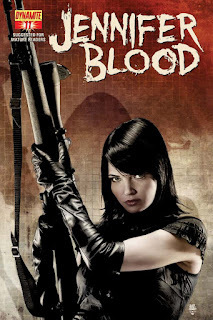 This book is about a housewife-turned-vigilante who calls herself Jennifer Blood. She takes down criminals and takes care of her family. In this issue Jen has raised the ire of yet another crime boss, and has to leave her family in the lurch for a bit while she attacks. Her husband struggles with her absence, and Jen meets a new threat. Vigilante violence meets domestic discord. Hardly a surprising combination given the circumstances, but it works well here. The violent side is pretty straightforward (and well drawn, I might add) and the ‘checklist’ narration adds nicely to the feel of the story. And on the family side, the story is done well enough that it’s hard to tell whether Jen’s domestic skills or hubby’s total incompetence that causes the obvious marital strife. This is a fun book overall. It’s certainly aimed at an adult audience, though. But it’s got plenty of explosions and enough crazy to go around. JENNIFER BLOOD #11 is available now at your FLCS or by order from dynamite.net.